You’ll find great views, food and fun at these local favorites. 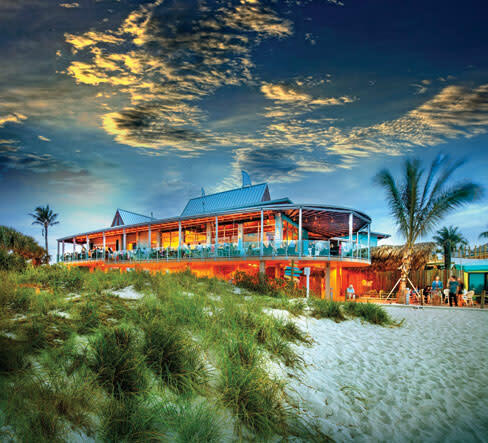 It doesn’t take much to fulfill every diner’s Florida dream: just a million-dollar view of sparkling blue-green water, a relaxed atmosphere, some fresh Florida seafood and pretty tropical cocktails. Fortunately, Sarasota offers a wealth of places that provide all that and more. Most are casual, a few are upscale, and more than you might imagine offer seriously good food. Here are seven of our favorites. 1601 Ken Thompson Parkway, Sarasota. Condiments are corralled in a dog bowl in the center of your table at the Old Salty Dog (above), a big seafood shack where you can eat eyeball-to-eyeball with pelicans. 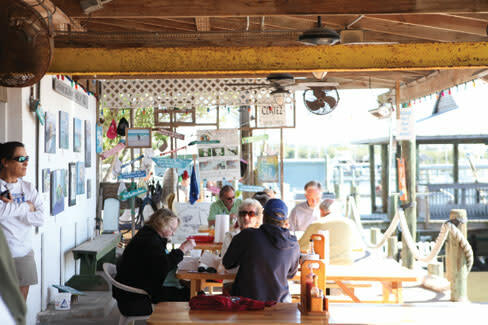 Situated on the Intracoastal Waterway near Mote Marine Laboratory, this big fish-camp kind of a place seats 165 in a variety of waterside spots—inside the high-ceilinged main room, on a narrow porch, at the bar (one inside, one outside) or on the deep and weathered wraparound deck. You get drinks in plastic glasses, food in baskets, plastic chairs and incomparable scenery while you enjoy a fried grouper sandwich ($15.99) with light, crunchy almost-tempura batter or a City Island Po’Boy ($14.99) with fried shrimp and oysters on a nontraditional po’boy soft bun. Also on the menu: fish tacos, Maui burger and lobster roll as well as hot dogs, turkey and beef hamburgers. This is casual food in a laid-back, rustic environment that features all things nautical including a big marlin on the wall. There’s a full bar, and if you like a cocktail before a meal, go for the Key Lime Colada ($9.95), a lime rum piña colada with a floater of Keke Key lime liquor. Looks pretty and tastes sublime. Logo T-shirts for sale at the tiny souvenir niche in the big room. Lunch and dinner, late night, too. 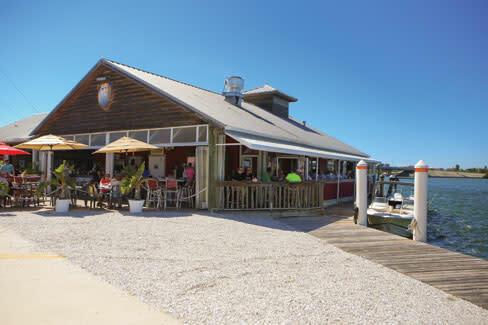 Sooner or later, everyone goes to Marina Jack, because the views are so delightful and the restaurant offers two different options for experiencing those views and seafood specialties. Upstairs is more formal, with a sophisticated nautical theme and walls of glass that provide an expansive overview of the Intracoastal Waterway. Upstairs dishes include presentations such as sherry and crab bisque, Creole seafood pasta, Chilean sea bass, potato-crusted grouper ($29), or pan-seared diver scallops at $33. Full bar and an impressive wine list. Downstairs at Portside Patio, the ambiance is casual and laid-back, and you definitely can come as you are off the boat. 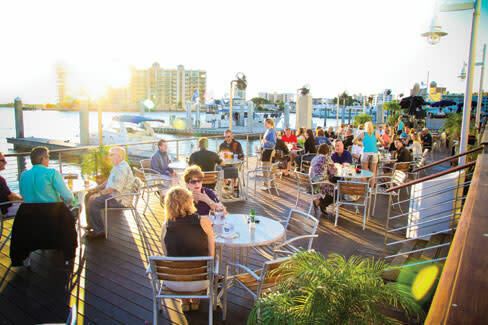 Enjoy the array of pleasure boats (the restaurant really is at a marina), watching the birds and spotting dolphins and manatees as you tuck into a blackened grouper wrap ($17.95), crab quesadilla or an Angus double cheeseburger ($12.95). Other good sandwich choices include a Cuban or classic Reuben. Live music nightly, and the patio people party on until 1 a.m. The Portside Patio is family friendly and welcomes dogs, too. Always a good vibe at this place, with a mix of guests evenly split between locals and tourists. Lunch and dinner. Live music most nights. Co-ed sand volleyball on Wednesdays. 801 Riverside Drive E., Bradenton. 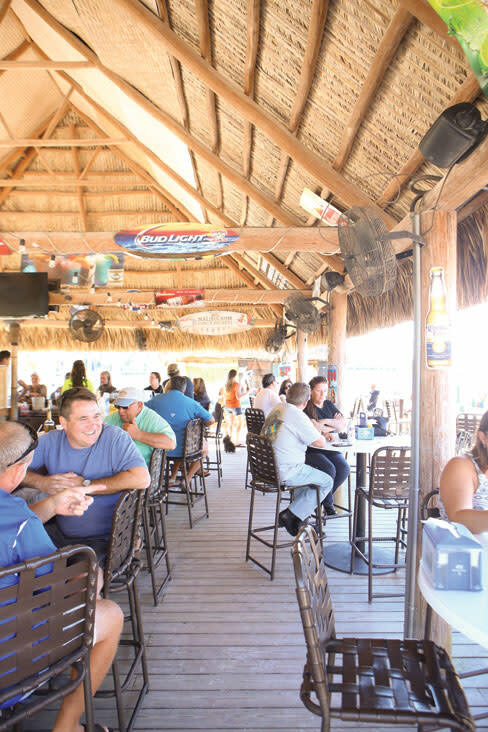 With its 3,000-square-foot tiki bar, you can bet that plenty of locals and tourists gather under the thatched roof at the Tarpon Pointe Grill & Tiki Bar to meet friends, order a specialty drink and listen to live music while looking out over the serene, wide waters of the Manatee River. After the cocktail hour, you can dine al fresco on the deck. This big, sprawling restaurant on the river offers casual favorites, including some Southern specialties, served informally but with flair. It’s a fun place to have a drink and order some food, and it attracts a mix of all age groups. Non-alcoholic drinks include an impressive collection of all-natural smoothies ($4.50). Nice buzz, and everyone is in a happy mood. The vividly colored menu offers six specialty burgers ($9.50-$12.50), including a veggie one made with black beans. Or eat Old Florida-style with the shrimp po’boy, grouper sandwich, Southern fried catfish ($13.50), sweet potato fries, or maybe a plate of grilled salmon with an orange-ginger glaze served with dirty rice for $16.50. Besides food, drink and live entertainment, Tarpon Pointe owners are always organizing special events, and there’s co-ed beach volleyball on Wednesdays. Market and dockside restaurant. Lunch and dinner. Cash only. 12306 46th Ave. W., Cortez. Star Fish Company, both market and dockside restaurant, started as a fish market in the 1920s in the historic commercial fishing village of Cortez. The village itself has escaped gentrification and is funky Old Florida at its picturesque best. The seafood you buy to eat from the Star Fish Company kitchen or take home from the market could not be any fresher. This simple little spot has won national accolades in recent years, including from Travel + Leisure magazine. The freshness of the fish calls for grilling, a quick sauté or lightly frying. Sides are simple and Southern—hush puppies, cole slaw, cheese grits and French fries. You stand in line (sometimes a long line) to place your order, pay cash and receive your food neatly arranged in a white box with plastic utensils. Then find a spot at communal whimsically painted picnic tables on the dock. The view from your bench is of Jewfish Key, Longboat Key and Bradenton Beach. And, naturally, you’ll see lots of boats. Some of the names are worth remembering. A combination platter (shrimp, oysters, scallops and grouper) is $16.95. Conch fritters are $9.50, and a delicious tomato-based seafood chowder is $2.82 for a generous cup. Florida pompano is a house specialty at $13.95. Sandwiches, salads, appetizers, beer, wine and soft drinks. Breakfast, lunch and dinner. Reservations suggested. The Ritz-Carlton, Sarasota, 1111 Ritz-Carlton Drive, Sarasota. On Saturday nights, a live glittery mermaid sits atop the glass raw bar at Jack Dusty, the dining space of The Sarasota Ritz-Carlton hotel. Kids think she’s Ariel and take pictures. The large indoor/outdoor room has a coastal contemporary vibe that is sophisticated but not fussy. 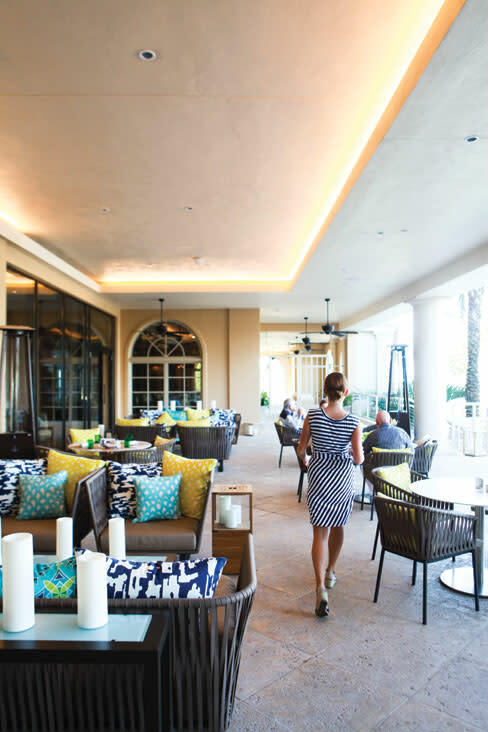 Sit at the bar, high-top tables, sofas, or tables on the veranda or inside. From most tables, you’ll have gorgeous views through the palm trees of the boat basin, swimming pool and the Gulf beyond. Go at sunset for a real thrill and soak up the vacation ambiance. The modern nautical theme is carried out in detail; the silverware has mermaid tails and there are shells, beach glass and nets artistically lying about. Even the light fixtures are special. Jack Dusty is locally renowned for craft cocktails, so do let lead bartender Ingy make you a Siren ($23), a fruit-and-rum (or vodka-based) beguiling beauty that’s all about designer-infused ice and how it changes the flavor profile of the drink as it melts. Order the Sarasota cioppino ($28) for the local flavors of Gulf shrimp, bay scallops, clams, mussels and grouper in a light and flavorful tomato broth with a snap of orange peel to brighten up everything. There are big slices of toasted baguette to sop up the soup. Other seafood options to try might be shrimp and grits, blackened grouper, Everglades frog and crayfish gumbo, Jack’s lobster bisque, crab cakes, or a pile of peel-and-eat shrimp. Jack Dusty has understandable tourist appeal, but locals admire it, too, for an exceptionally high level of hospitality, ambiance, food and drink. Lunch and dinner. Live entertainment. 1600 Harbor Drive S., Venice. If you’re staying anywhere near Venice, you’ll eventually find your way to Sharky’s on the Pier. Everyone does, and everyone has a good time. Gaze out over the Gulf of Mexico, walk beautiful, unspoiled Caspersen Beach, play with the kids in the warm Gulf water, make sand castles or work on a Florida tan. And there’s a long fishing pier, too, in case you want to drop a line and test the waters. This place is a big beach playground. When it’s time to eat, select the slightly fancy Fins upstairs with indoor or covered deck dining, or choose the more casual Sharky’s or the Tiki Bar. There are so many options that you can easily find your special spot. The Sharky’s menu is extensive, meant to appeal to everyone and anyone. And it does. The Gulf Mix is a casserole of grouper, shrimp and scallops for $26. Something lighter would be a seadog shrimp flatbread ($10.50). Want some heat in that dish? Then go for the island jambalaya, which has Caribbean spices and andouille sausage. Regulars are attached to the black bean cakes, crab stuffed mushrooms, buttermilk onion rings, fried bay shrimp, seafood nachos and the rich lobster-stuffed flounder for $19. You could go back for months and never have the same thing twice. Time your trek to Sharky’s on the Pier to include a fabulous sunset over the Gulf. It will become a memory of a perfect vacation. 760 Broadway St., Longboat Key. 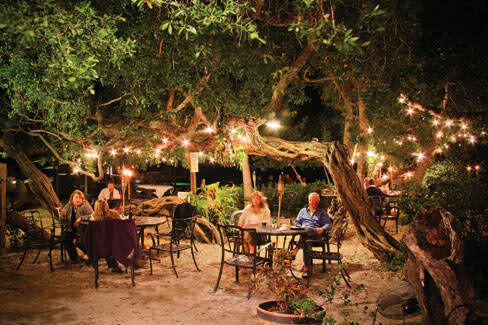 Mar Vista Restaurant and Pub on the north end of Longboat Key should be high on your list of places when you want to experience the taste and feeling of Old Florida. The building, which dates from 1912, is one of the 12 oldest surviving structures from the 1921 hurricane that wiped away chunks of the scenic barrier island. You can eat inside at a pleasant and casual dining room, but choose a spot on the covered deck overlooking the bay. Listen to the gentle swells lapping the deck and feel the stress drain away. A beer finishes off the change in attitude. Now, you’re ready for a grouper sandwich (market price) or a Mar Vista seafood platter, which is fried fresh fish, shrimp, scallops and a crab cake for $26.99. Or maybe a grouper quesadilla, crab pasta salad, seared tuna, or the Longboat Pot, which is two kinds of crab, shrimp and mussels ($29.99). The Cold Combo Sampler combines raw oysters and boiled shrimp for $15.99. This charming place is hugely popular with locals as well as seasonal visitors because of the menu, ambiance and freshness of all the food. Have someone take your photo relaxing on the deck sitting behind a great pile of delicious Florida seafood. You could be a postcard.